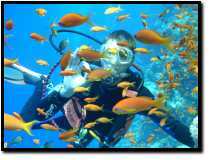 Red Sea Holiday Apartments - Sharm el Sheikh - Diving. The Red Sea for divers and snorkellers is a sheer paradise. The coral reefs are among the most fascinating and easily accessible in the world. Lagoons, coral gardens and deep coral walls team with a variety of marine life. The sparkling waters are warm, the visibility is crystal clear, and the sun shines all year round. The daily diving from Sharm el Sheikh is by boat. The dive sites are mostly off shore patch reefs for the more experienced diver, and can be in the Straits of Tiran, or The Ras Mohammed National Marine Park. However, for the less experienced or novice diver, we have local shallow reefs and coral gardens close to Sharm el Sheikh. These are ideal sites for Intro dives, Try Dives and snorkellers. A typical day out with us on the dive boat. Leave the jetty at 08.30.
and catch some sunshine while relaxing with your favourite book. and start first of 2 dives of the day. Dive time usually 50 to 60 minutes. Lunch is usually served around 1PM, open buffet style, and relax on the sun deck. Around this time we normally conduct the Try Dives and Intro Dives in the shallow areas of the reef. Snorkelling for non divers can also take place here. The boat then moves to the second dive site of the day around 14.30.
and arrive at the jetty around 16.30. What to bring with you on the boat. Ample supply of sun screen, hat, dark glasses, towel, money for lunch and drinks, approx. 40 LE. Something to read, camera. Sea sick tablets if necessary.